Following on with our GeoSocial Analysis work, we recently had a paper published in PLOS ONE entitled “Crowdsourcing A Collective Sense of Place.” In the paper we discuss and showcase how one can take a quantitative approach to derive a collective sense of place from Twitter contributions and also from corresponding Wikipedia entries.To illustrate this we present a brief study three cities, that of New York, Los Angeles and Singapore. Below you read the abstract of the paper, see some images from the paper especially the flowchart describing overall process used to discover platial alignment, along with the full reference to the paper. Place can be generally defined as a location that has been assigned meaning through human experience, and as such it is of multidisciplinary scientific interest. Up to this point place has been studied primarily within the context of social sciences as a theoretical construct. The availability of large amounts of user-generated content, e.g. 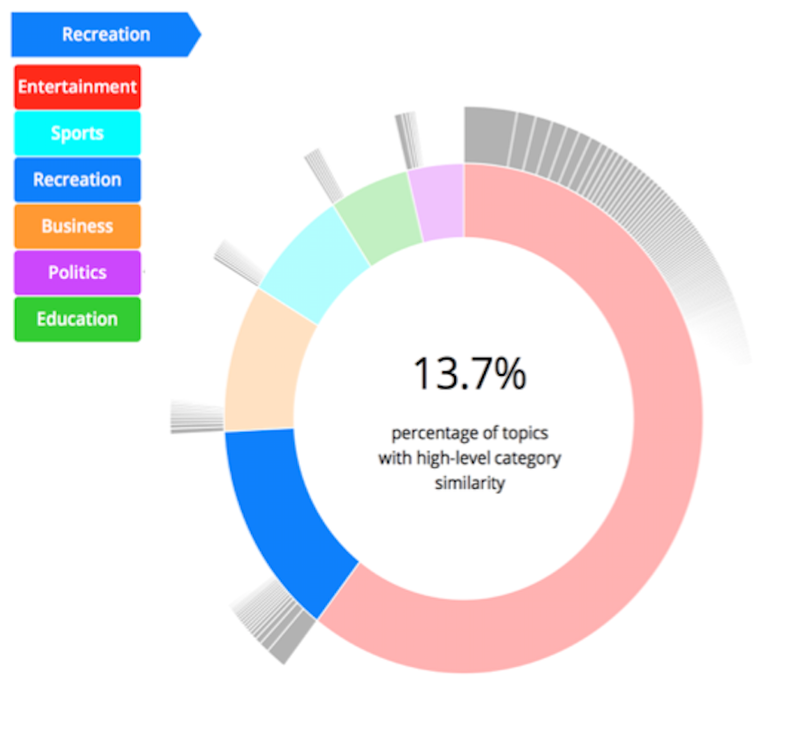 in the form of social media feeds or Wikipedia contributions, allows us for the first time to computationally analyze and quantify the shared meaning of place. 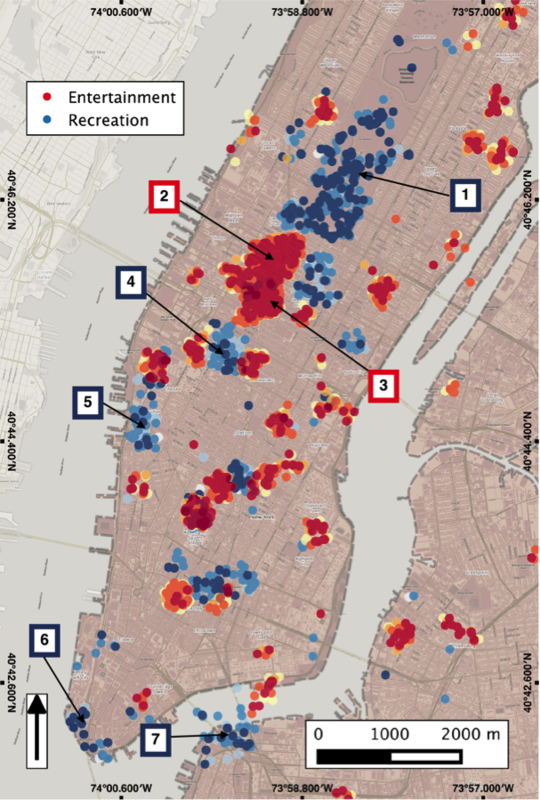 By aggregating references to human activities within urban spaces we can observe the emergence of unique themes that characterize different locations, thus identifying places through their discernible sociocultural signatures. In this paper we present results from a novel quantitative approach to derive such sociocultural signatures from Twitter contributions and also from corresponding Wikipedia entries. By contrasting the two we show how particular thematic characteristics of places (referred to herein as platial themes) are emerging from such crowd-contributed content, allowing us to observe the meaning that the general public, either individually or collectively, is assigning to specific locations. Our approach leverages probabilistic topic modelling, semantic association, and spatial clustering to find locations are conveying a collective sense of place. Deriving and quantifying such meaning allows us to observe how people transform a location to a place and shape its characteristics. 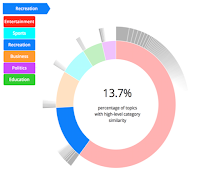 Keywords: Online Encyclopedias, Twitter, Data Visualization, Social Media, Semantics. Flowchart describing overall process used to discover platial alignment. Maps depict significant hotspots for each of the high-level categories for (A) Singapore, (B) London, (C) Los Angeles, and (D) New York City.